Save money. Stay up to code. Call us today at 434-239-0371 for your free consultation! 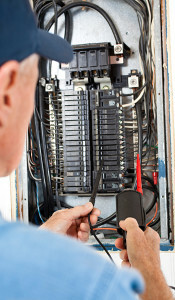 Wooldridge has a full-service electrical department with a team of licensed, professional master electricians. They are certified in residential, commercial and industrial electrical installation, initial servicing, new wiring, replacements, and updates. We specialize in rewiring older homes to meet current building code regulations and help you save money on future utility bills. Our electricians are available to complete full home energy saver inspections and determine ways to minimize your energy consumption.